Bay Area basher and thrashers, Testament, has spent nearly a decade recording with Spitfire Records – and in that time a slew of classic metal tracks were recorded and unleashed upon the music industry. 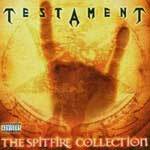 The Spitfire Collection is a time capsule, if you will, of that era. Opening the album are three explosive tunes from the album Live At The Fillmore. A thunderous version of "The New Order" - one of the songs in the thrash world that affirms my belief that if a thrash song is done well, it can have melodic parts in it as well as the head banging, shredding drive the genre is famous for. "The New Order" is followed by fierce and heady live versions of "Souls of Black," probably my favorite Testament song of all time, and "Practice What You Preach" – a song that's simply impossible to sit still through. Then off of the album Demonic, the fist in your face "Hatreds Rise," the gutturally spooky "The Burning Times," and musically macabre "John Doe." From the album The Gathering, is "Careful What You Wish For" - marching to the beat of a wild-man drummer, "Down For Life" which I strongly discourage anyone from listening to in their car unless they want a speeding ticket, and the throbbing "Riding The Snake." "Over The Wall" and "The Preacher" ripped forth from the album First Strike Still Deadly – melodic metal at its finest. And wrapping up the disc with a true roar are three songs off of one of the best live rock and roll recordings ever – Testament Live In London. "Into The Pit," "Trial By Fire," and the legendary "Disciples Of The Watch." Even if you're not a thrash enthusiast, any lover of music - and particularly metal - can appreciate Testament as one of the essential cornerstone bands who have helped make music what it is today.